One of my favorite things about our local fireman’s carnival in the summertime is their homemade caramel corn. Sure, you can get great caramel corn on the boardwalk in Ocean City…but the site of a giant copper kettle full of popcorn, butter and brown sugar being continuously stirred by one of our local hard-working guys is one to behold. For me, that scent wafting through the air means summertime on Chincoteague. But then fall arrives, and the carnival is over for another year…leaving me without a giant tub full of caramel corn to munch on. So, I decided to start taking matters into my own hands a couple years ago, and started making my own. 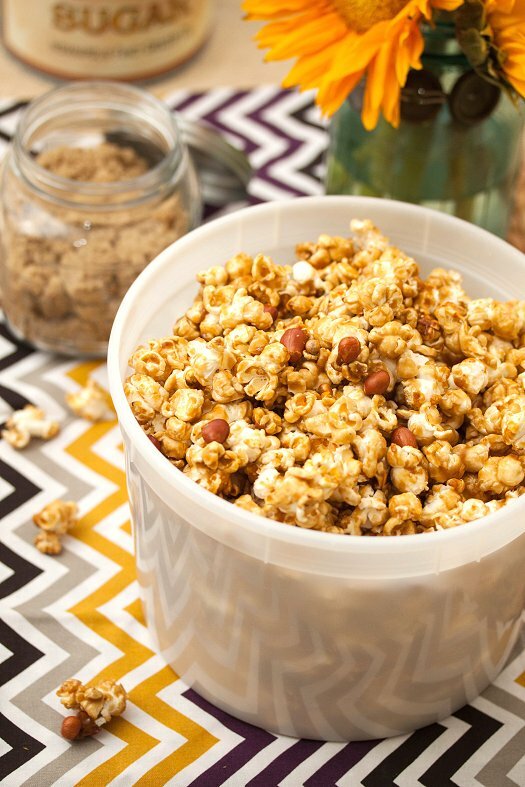 A few basic ingredients and about an hour – and you have a giant batch of caramel corn that stays good for a couple weeks, or also make excellent gifts when bagged up and tied with a pretty ribbon. Peanuts, are of course optional…but we love the nutty crunch that it adds. Looking forward to playing around with some different ingredients to change the flavor up a bit…maybe a little cayenne to spice things up, or a little cinnamon and nutmeg for an autumnal spin! With Halloween coming up, it’s the perfect excuse to try making this classic for yourself at home – you won’t regret it! Preheat the oven to 250° F. Line two baking sheets with a silicone baking mat or parchment paper, set aside. Pop popcorn using your preferred method, I use and air-popper and have to do two batches. Place the popped popcorn onto the baking sheets. Meanwhile, to make the caramel, melt the butter in a medium saucepan set over medium heat. Once the butter is melted, mix in the corn syrup, brown sugar and salt. Increase the heat to medium-high and bring the mixture to a boil, stirring frequently. Once the mixture reaches a boil, let the mixture continue to boil for 5 more minutes without stirring. Remove the mixture from the heat, stir in the baking soda and vanilla extract. The mixture will bubble up and become frothy. Evenly drizzle the caramel sauce over the popcorn on the baking sheets, and use a silicone spatula to gently toss and coat thoroughly. It’s okay if there are some clumps of caramel throughout, it will melt and become better spread out while baking. Bake for 40-50 minutes, removing from the oven to toss/stir every 10 minutes. After 40 minutes, test a cooled piece of popcorn. If it is not completely crispy (i.e. still slightly mushy when you bite it), bake for 10 minutes more. Remove the baking sheets to a wire rack and allow popcorn to cool completely before breaking apart for serving or packaging. Can be stored in an airtight container for up to 2 weeks (no way in hell it’ll last that long). I need advice/help. I make a recipe similar to this. I use to make it and it turned out perfect every time. After not making it for several years, I can’t get it right! Once I start the baking process the sauce isn’t smooth – gets frothy and puffy while baking. Do you have any ideas for me? Hey Dana! The mixture will puff up a little bit in the oven. I just stir occasionally to keep it down to a minimum. And, it usually settles down once you take it out. Also, make sure you combine the baking soda well before adding it to the popcorn. Maybe you’re getting pockets of it? Best of luck!